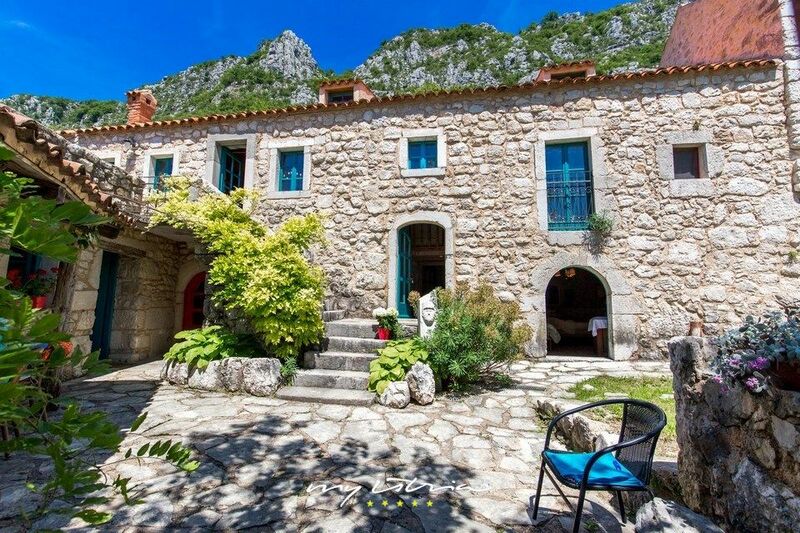 Set in an absolutely stunning location, in a small village under the protection of the Ministry of culture and admist the lovely Vinodol valley, Villa Belga is a perfect choice for those who desire a peaceful vacation with guaranteed complete privacy. Hills and forests in the background and a breathtaking view of the sea are just one of the many perks of this idyllic villa. This astonishing rural house was restored in harmony with the surroundings and tradition, with thick stone walls, wooden beams, vintage furnishings and carefully chosen details, adding to its indisputable charm.The villa has altogether 5 bedrooms and can accommodate up to 10 persons, which makes it appropriate for larger families or groups. Due to natural shade and a pleasant temperature, the villa´s garden is a perfect place where you can relax and enjoy your vacation. The villa also has 2 cosy terraces, one on the first floor and the other one in the garden. If you feel like cooking, near the terrace in the garden you will find a barbecue, where you can make different mediterranean specialties and fully experience traditional life in Croatia. Wir waren zwei Wochen in der Villa Belga und können uns der letzten Bewertung in allem anschließen. Es ist sehr schön mit einer großen Obstschale empfangen zu werden. Bei uns war alles sauber und der Pool wurde perfekt gepflegt. Samstags wurden Bettwäsche, Hand- und Geschirrtücher gewechselt. Man findet vieles, alltägliches, das in anderen Wohnungen nicht vorhanden ist. Die Villa hat den Reiz, den es auf den Bildern verspricht. Wir hatten einen Hund dabei, der durch den abgeschlossenen Innenhofbereich immer frei laufen konnte. Besonders schön sind die Felswände und die Abgeschiedenheit. Uns macht es nichts aus, dass unterhalb ein Friedhof ist. Vom Stil der Einrichtung, dem Mut die sanitären Anlagen derartig zu gestalten und dem "Burgcharakter", der Lage würde ich gerne 5 Sterne geben. Der Stern Abzug ist für die Betten, die einzeln gestellt sind, da schläft man wohl schlecht und die Dusche über diesem Zimmer lief über und tropfte in den Stock drunter. Wir hatten sie dann nicht mehr benutzt, sind ja einige Duschen da, die einwandfrei funktionieren. Diese Mängel sind allerdings zu beheben. Die Villa ist auf alle Fälle eine tolle Unterkunft und etwas ganz anderes als "normale" Ferienhäuser. Super Idee sie so zu gestalten. Das Haus ist ein Traum. Mit Liebe und Geschmack (alles stimmig) eingerichtet. Bemerkenswert ist die Ruhe dort! Nur Vogelgezwitscher und Grillen. Sonst nichts. Dadurch haben wir niemanden gestört - auch als unsere Poolparty mit Musik mal lauter war als gewöhnlich :-) Und uns hat halt auch keiner gestört. Die liebe Marion (zuständig fürs Haus) war jeden Morgen um 6 Uhr da und hat den Pool sauber gemacht. Wir haben sie nie gehört oder gesehen. Wie ein Heinzelmänchen. Perfekt. Die Küche ist mit allem ausgestattet, was man braucht. Die Geräte haben zwar schon ein paar Jahre auf dem Buckel, aber egal. Sie funktionieren ja. Von uns gibt es keinen Abzugspunkt! Einfach ein geiler Urlaub. Wir kommen wieder! As a group of 10 we had a wonderful stay at Villa Belga. We were greeted by Jasna who walked us through the villa and the history of this beautiful space. Jasna also gave us many helpful tips including highlights to visit and restaurants to dine in throughout the surrounding areas. The villa was clean and cosy on the inside and boasted beautiful views from the outside. There was a huge pile of wood chopped ready for us to use for the fire and also a lovely big fruit bowl for us to enjoy. As a large group we all fitted comfortably and enjoyed many nights around the fire inside this beautiful villa. This place comes highly recommended. Thank you. We have booked Villa Belga for 12 nights late May 2017 and were the first visitors post the winter break. The setting and location is beautiful - very rural house and peaceful setting. Probably worth mentioning that direct access to the villa is only via a small gravel road uphill which can be nasty for bigger cars - no issue with a small rental car though. There is the chance to park approximatly 100 m away from the villa at the grave yard public parking which is safe. You will need to walk uphill to the villa from there. Not an issue for us as we like quiet neighbors but might be of concern for the ones that do not wish to spend their holidays next to a grave yard. The host was very friendly and people in Croatia are generally great. On arrival we received a big fruit basked and two bottles of local red vine, very nice. The outdoor area of the villa is fantastic, the pool is cool with some shade, kids play ground is fantastic. Coming to indoors, the villa has a couple of downsides, mainly connected to cleanliness. First off all it smells old and moldy, in particular in the two ground floor bed rooms which we did use for bike storage. It might well be that it was probably not aired sufficently over the winter. In the top floor bedrooms, the smell was apparent but after some airing it was all right. However, one wardrobe in the fist floor bedroom had severe mould in the drawer, smelly, not nice and not what you would expect from a villa in this category. Bathrooms are tiny, one bathroom had mould on the sealing, the sink pipe was leaking and the toilette bowl was not properly fixed. Overall cleanliness was not too great. During the last week, the pool pump broke down and was not repaired so the pool was full of crap, it was OK in the first week though. As per myistria.com description, there would be a weekly change of bed linen, there was none in our case. In a nutshell, the holiday was very nice except for the issues listed above. The villa is situated near Grizane in Vinodol valley, famous for its natural beauty. You can enjoy a breathtaking view of the hills and still - it takes you only ten minutes to the sea. There is a famous rural restaurant in the hills (about 20 minutes by car) with traditional food on the menu and the road that will take you there has an amazing view over the magical Kvarner Bay. In our villa you can enjoy your holiday in full privacy and beautiful nature. Traditional domestic cheese, honey, jam, brandy, olive oil, wine, etc. can be sampled in the surrounding villages. There are wine roads and summer fests in Pavlomir, vineyard situated 15 minutes from the villa. In Crikvenica and Novi Vinodolski you can enjoy Mediterranean food in fine restaurants or buy fish, meat, vegetables and fruit at the local market-place.